Funcom‘s The Secret World gives its players an unique challenge this year with brand new monsters to fight and a dangerous place of ice to explore. The Krampus roams the land in search of naughty children to punish. But the players have the chance to turn the tables on this wicked creature. Those who are clever can follow the Krampus to its home in Niflheim. In this brutal land of frost and ice the players can not only battle legions of Krampus, but also uncover a secret ritual to summon Hel herself and do battle against this god-like being. But the greatest challenge comes for those who manage to lure Hel into the real world and take her on in an epic raid size challenge. This all new event called A Mother of a Season does not only bring these challenges, along with many new and unique rewards and outfits, but also lets those who fight in player versus player battles become The Lord of Misrule. Anyone fighting in PvP may become The Lord of Misrule, which makes them change shape (to a Krampus in a Santa outfit) and get many new and wondrous abilities, like dropping exploding presents on their opponents. The brand new Christmas event called A Mother of a Season starts today and will last until the 2nd of January. A tweaked End of Days also makes a comeback this year, so you have tons of great challenges and special rewards to look forward to! The brutal Krampus is scouring the land for people to punish, but if you are clever you can turn the tables on the Krampus and prevent him from escaping your wrath. The Krampus opens a portal to Niflheim itself, the land of frost and ice, and you can enter this terrible place if you dare. Within you will find a host of enemies, so getting some friends to help you might be a good idea. Niflheim holds many mysteries. The most secret of these is the ritual to summon Hel herself! Fight Hel in Niflheim for a great challenge and to receive unique rewards. But the greatest battle will take place if you manage to lure Hel out of her realm and into yours. This extremely dangerous ritual is not to be taken lightly, and any details surrounding it are murky at best. Everything must be just right for the ritual to work. The picture at the bottom of this article is the only known clue to finding the spot where the ritual may be completed. Krampus, Niflheim and Hel are only part of what you can enjoy this Christmas. 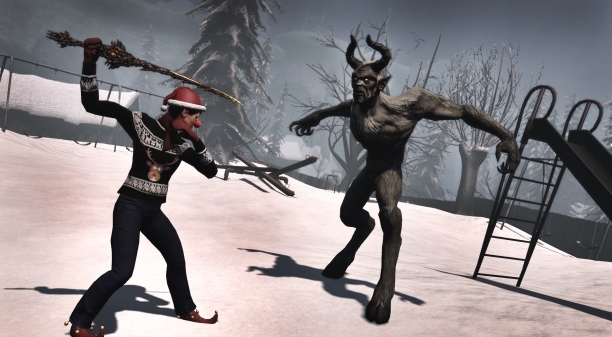 The Secret World picks up the old tradition of having a Lord of Misrule for the festivities. Those who are playing in PvP can receive the Lord of Misrule title. Not only does the Lord of Misrule change appearance (he ends up looking like a Krampus in a Santa outfit), but he also gets many awesome and unique abilities, like a powerful knockback shield or being able to drop exploding presents on his enemies. You can only be the Lord of Misrule for 5 minutes at a time, but whoever kills the lord gets the honor of becoming the Lord of Misrule himself! So the time to enjoy Christmas is here. Get your hands on tons of brand new rewards and outfits, both in the Item Shop and as unique loot. Krampus, Hel, the Lord of Misrule and the End of Days are here for everyone to enjoy! This entry was posted on Thursday, December 19th, 2013 at 10:48 am and is filed under Mature, National News, New Releases, RPG - MMORPG. You can follow any responses to this entry through the RSS 2.0 feed. You can leave a response, or trackback from your own site.